In an effort to foster a peaceful environment on all waterways, Wake Responsibly is a campaign that educates homeowners and boaters about courteous behavior to ensure every moment on the lake is safe and enjoyable for all. Over the years, there have been dozens of cases where homeowners have attempted to shut down water sports across various waterways in the United States due to complaints of shoreline erosion, damaged docks and/or loud music. As the towed water sports industry’s leading advocate for preserving the vitality of these activities, the WSIA has been an integral part in fighting for continued use of these waterways under attack. In 2015, Ocean Engineer and Naval Architect Clifford Goudey scientifically studied and collected wave energy data on the characteristics of boat wakes. After analyzing the data, the WSIA, along with other industry leaders, have developed best practices to maintain waterway access rights, educate participants, promote safety and captain’s etiquette, and thus facilitate sustainable industry growth. Those massive wakes that are prime for your surf game are not so prime for the shoreline and structures on your waterway. Staying at least 150 feet away from docks and beaches allows boat wakes to recede enough to minimize any adverse effects when they hit shore. Don’t worry, people will still be able to see your fancy moves from afar. We realize that marine audio stereos are better and louder than ever before. Although water activities and cranking tunes go hand-in-hand, it is important to be considerate of the time and situation as well as homeowners who might prefer calm and peace over The Weeknd’s new album on blast. We all seek the calm, protected shorelines, and once we find it we claim it as ours. However, repetitively driving back and forth in the same line can damage shores and docks. After a few passes, you’ll have churned up the water anyways. Take a break, move to another location, and return later. Your spot will still be there when you return. In order to protect towed water sports activities for years to come, the WSIA urges all boaters to follow these guidelines and help spread the word to those who might not understand. Don’t be afraid to approach another boater who is acting out of line and kindly explain the code of conduct, so that wake sports can be accessible for many generations to come. 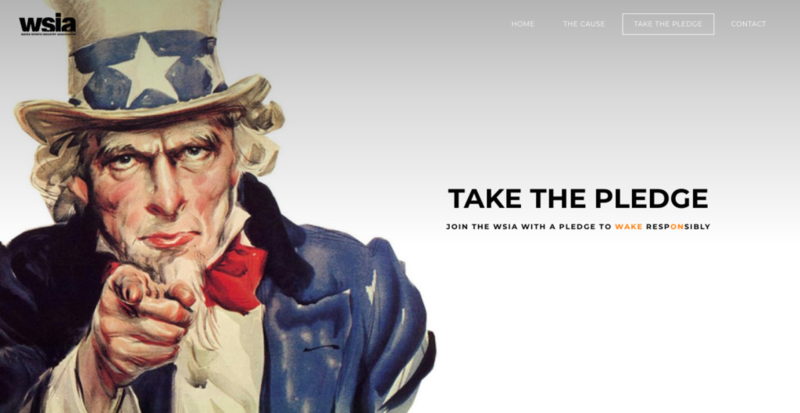 Head over to wakeresponsibly.com to learn more and to take the pledge to wake responsibly today! Not only are you protecting the waterways, yourself and your friends, but you will be entered to win some cool gear from your favorite brands.